The Air Jordan 14 Retro Low "Laney" is now available in the Philippines. A salute to Michael Jordan's High School, the Air Jordan 14 Low features a low-top silhouette but looks and plays like a mid top due to the collar. 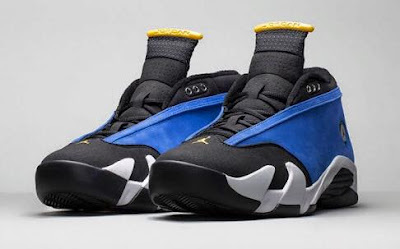 Blue and black was used in with yellow accents on the tongue and the Jumpman branding. The midsole features a white fang-shaped cut in the forefoot area. The Jumpman logo in the lateral aspect of shoe has a "Ferrari-like" look where the shoe draw its inspiration. You can now grab a pair at Nike Stadium Rockwell, ATC, SM North, and Shangrila for Php 8,545.